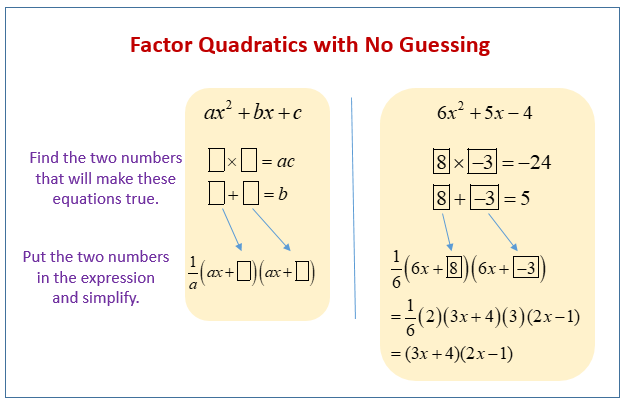 Examples, solutions, videos, games, activities, and worksheets on factoring quadratic equations with leading coefficient ≠ 0 that are suitable for GCSE Maths. The following diagram shows how to factor quadratics with no guessing. Scroll down the page for more examples and solutions of factoring quadratics. How to factor quadratic equations with no guessing and no trial and error? A quick method for factorising quadratic expressions where the coefficient of the x squared term is not 1. This is a quick method that allows the correct answer to be achieved without trial and error and guess work.